We’d love your help. Let us know what’s wrong with this preview of Letters from Verdun by William C. Harvey. Though the United States was late to enter the Great War, a number of idealistic young Americans wished to take part from the beginning. One of these was Avery Royce Wolf, a highly educated scion of a family in America's burgeoning industrial heartland. Volunteering as an ambulan A beautifully written and fully illustrated experience of the Great War from a participant . 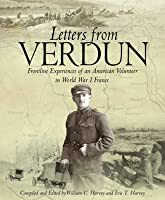 . .
Volunteering as an ambulance driver with the French Army in the Verdun sector, Royce sent back a constant stream of highly detailed letters describing the experience of frontline combat, not excluding comments on strategy, the country he encountered, and the Allies' prospects for success. The book contains expert overviews to set the reader in Royce's time and place; however, the narrative is most gripping with his own day-to-day perceptions, analytical and emotional in turn. The reader can sympathize with Royce's dilemma when his original term of service expires and he wonders whether to return home. But then the American army begins to arrive and he decides to continue on. We hear firsthand how the U.S. troops are first kept out of battle, then take casualties no veteran unit would have sustained, because of their fresh-faced audacity. 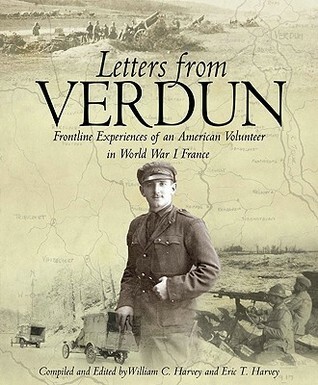 To ask other readers questions about Letters from Verdun, please sign up. This book is mostly very good. The letters themselves, and the photos that accompany them, are fantastic and well worth the read. They are as good or better than most war diaries I have read; Wolfe was very thorough in his correspondence and managed to sneak quite a bit around the censors. His writing is entertaining as well as detailed. However, the sections each begin with extremely basic descriptions of what was going on in the war at the time each set of letters was written, and these are whe This book is mostly very good. The letters themselves, and the photos that accompany them, are fantastic and well worth the read. They are as good or better than most war diaries I have read; Wolfe was very thorough in his correspondence and managed to sneak quite a bit around the censors. His writing is entertaining as well as detailed. However, the sections each begin with extremely basic descriptions of what was going on in the war at the time each set of letters was written, and these are where the book fall just short. There is not enough nearly enough context provided, especially if the reader's knowledge of WWI is limited. But as one with a good knowledge of the timeline of the war, I found these editorial bits distracting rather than helpful. Wolfe gives more than enough detail in the news he hears to keep the reader conscious of about what time in the war it is. Avery Wolfe's voice came through strongly in his letters, although by the end I couldn't help but wonder how edited that "voice" really was. His photographs are even more telling then his narratives.